Fargo woodchipper scene redux… in real life. SALEM, Conn. — A 6-year-old boy helping his father on a landscaping job during school vacation was killed Tuesday after getting pulled into a wood chipper, state police said. This is one of most genuinely bizarre accidents I’ve ever read about. I’ve seen one or two in my lifetime, as well. And this one is genuinely miraculous, as well. It has a “happy” ending! 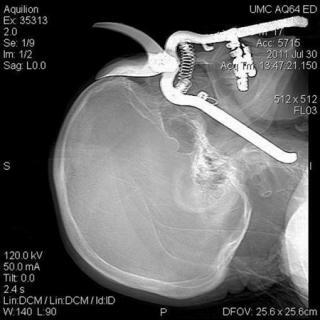 TUCSON, Ariz (Reuters) – An 86-year-old Arizona man who was impaled through the skull with pruning shears in a freak gardening accident was expected to make a full recovery, his doctors said. Leroy Luetscher dropped a pair of pruning shears while working in his yard in Green Valley, south of Tucson, on July 30, the University Medical Center in Tucson said in a news release. Sometimes, it’s difficult to have an effective title, or headline to a new entry, so I decided to have a bit’o fun with this one. The then-19-year-old Miss Bishop shot and killed her 18-year-old brother Seth, in the kitchen of their Braintree, MA home, after first “accidentally” discharging the same firearm in her bedroom upstairs, which blast her mother said she did not hear.